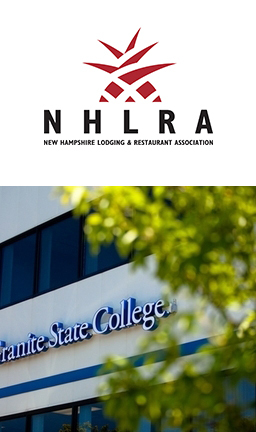 The New Hampshire Lodging and Restaurant Association (NHLRA) and Granite State College are celebrating a successful first class of graduates from a program created to attract and retain qualified hospitality leaders and managers. On behalf of NHRLA, we are proud to have kicked off the inaugural class of this certificate program with 17 participants completing the program and receiving certificates. NHLRA’s commitment to identifying best practices, determining how to engage the state’s younger generations and providing continual growth opportunities for current employees was key. The training partnership began with the creation of the Fundamentals of Hospitality Management Certificate program at Granite State College. The certificate program launched earlier this year and is focused on individuals in entry-level management positions through seasoned, veteran managers, and addresses skills needed in New Hampshire’s crucial hospitality sector. This three-part series was born out of NHLRA’s and Sector Partnerships Initiative’s (SPI) commitment to education and workforce development in the hospitality sector. This is the perfect example of the goal of SPI: growing the skills of the current and future workforce. The program does just that by teaching critical skills and being available to individuals with a wide range of managerial experiences. This program is the perfect example of the goal of SPI: growing the skills of the current and future workforce. Each area in the Fundamentals of Hospitality Management Certificate program teaches the skills that are necessary for a managerial role. Courses such as Foundations of Leadership, enables participants to identify their leadership styles and develop action plans to work on leadership skills; Effective Communication teaches the tools necessary to interact and communicate effectively with colleagues in an internal environment; and Confidently Handle Conflict teaches students about motivating employees, being proactive, and being confident while having hard conversations in a professional environment. The next Fundamentals of Hospitality Management Certificate program will be held at Granite State College’s Manchester campus, MillWest Building, third floor, 195 McGregor Street. All three parts of the program must be completed in order to be awarded a certificate. The Foundations of Leadership and Management portion will be held on Tuesday, June 12. Effective Communication will be on Tuesday, July 10, and Confidently Handle Conflict will be on Tuesday, August 7. Connect to the hospitality sector here.